Robust outboard cylinders for maximum accuracy. Wheels retract behind front edge of wings. Curved mold board reduces segregation and energy consumption. Grease free pivoting support wheels and walking beam. Rubber bump stops on walking beam. Twin mirrors for total view. For use with a bucket carrier. Graduated laser poles for quick adjustment. Concealed hydraulic valves out of harms way. The SharpGrade Dual Grade Leveller enables you to accurately level to within 3mm (less than 1/10"). 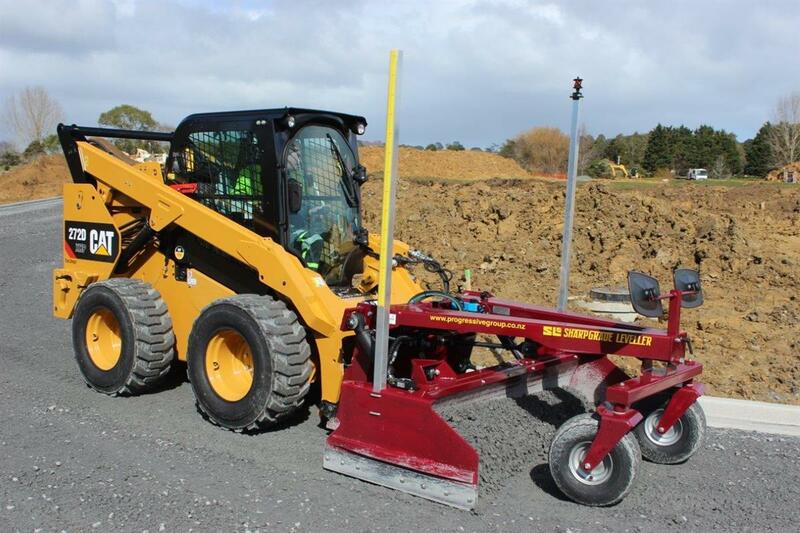 Using a SharpGrade Leveller is up to ten times faster than levelling using a skidsteer with standard bucket attachment. Designed specifically to work on skidsteer loaders the SharpGrade Leveller works in forward and reverse for optimal efficiency. Twin pivoting blades give the ability to cut, carry, trim, spread and finish in one pass, in either direction, for speed and control. A curved mouldboard ensures wet material can be easily rolled. Operated from your machine's hydraulic system, in-cab adjustments are a breeze and levelling is up to ten times faster than levelling using a skidsteer and standard bucket attachment. The SharpGrade Leveller is quick and easy to attach to your machine. No tools required, simply clip the unit into place and attach the hoses and you're ready to start work. The handy front mounted bucket carrier for ease of transport allows you to take both leveller and bucket to the job. Retracting wheels: Offer the ultimate in compact grading, get up close to walls, curbs, foundations or use as a bulldozer, while providing the shortest transport length in class. Adjustable hitch plate: Sets SharpGrade perfectly level with boom fully down to provide the ultimate in rigidity. This reduces track and tyre wear and boom and linkage wear as the SharpGrade is pushing on the front of the machine intead of transferring the load to the rear of the machine through the linkages. This is especially important with vertical lift machines. Twin parabolic mirrors: See the front blade and both front wing tips for confident grading in confined areas, along walls, curbs or foundations.